The bottom pond was full last weekend and has been turning green through the week. And I finished filling the top pond today. 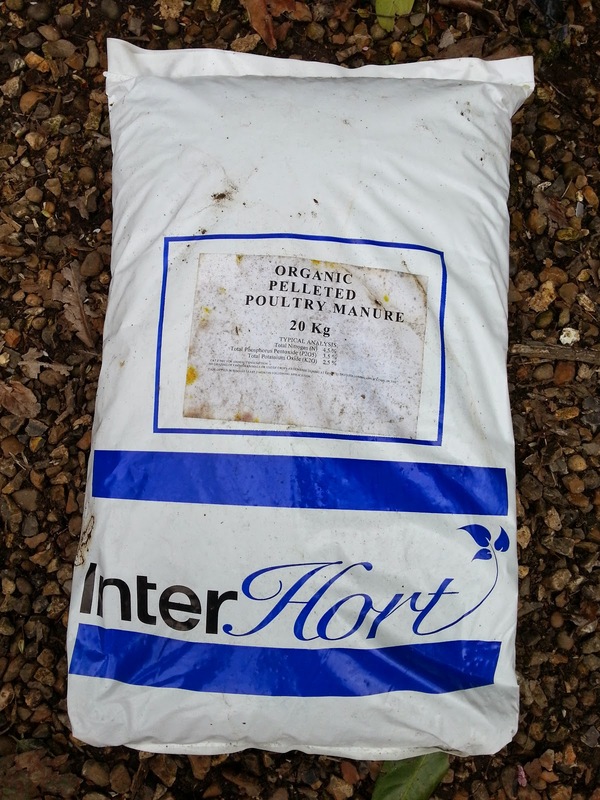 We fertilised both ponds this afternoon with chicken manure pellets at the rate of 1 and a half 20kg bags per pond. That's roughly what I went with last year from memory and we'll have to see how they get on this time. The bottom pond has started to go green, and that's happened faster than last year because I seeded it with some mature pond water. Inspecting the top pond which has water that is still clear - I found 3 frogs invading my space, and netted them out and relocated them. Two of them were clamped together, probably making new frogs, so I'm particularly pleased to find that pair before they pollute my pond with more frog spawn. After frog relocations, I pumped a few inches of the greenish water out of the bottom pond and into the top pond to give that a little boost too. All I need now is some sun. John Stevens has been back for a few days to help with some maintenance tasks around the polytunnel and ponds, and he plumbed in my new air source heat pump this week - and I finally got the thing going today. This is to provide heating to the females tank and gives me some more koi husbandry options. The temp hit 14C the other day, and initially I'll use the heat pump to maintain the temp gains and slowly bring the females tank up in the process. It's adding another c.35p per hour to my electricity bill, while the heater is on and I'll know in few days what the damage is over a 24 hour period. 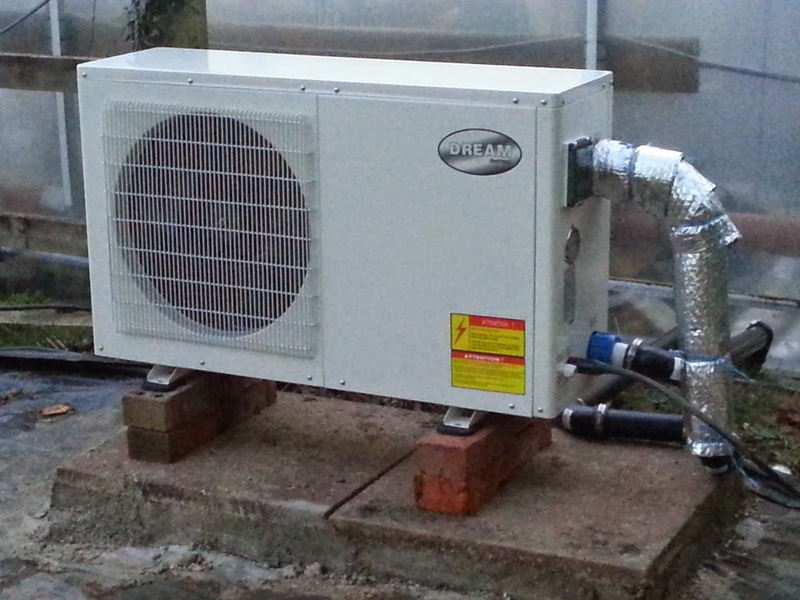 John built a small stand for the air source heat pump to sit on. We've made a start on the insulation but there's a lot more to add. I'm also having some improvements to the electrical set up completed too, including adding new circuits to the fuse board for each of the beefy 15kw air source heat pumps, and one for the sockets along the polytunnel (which I use to run all 3 ponds), and I'm having some new sockets added on the other side of the polyytunnel which will be really helpful at spawning time - I often run air pumps, and a few aquarium heaters to help me manage the spawning water; and these will be off another circuit in the breaker too. The other update is on pond treatments. 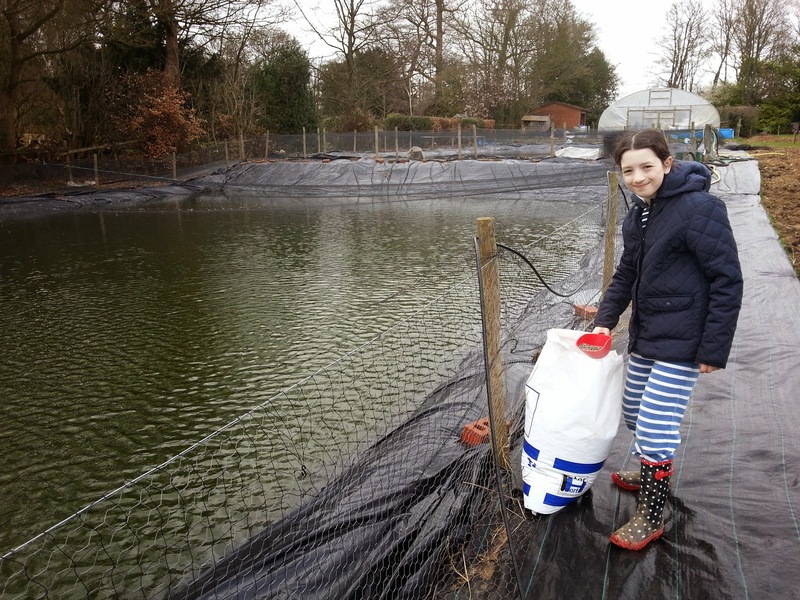 If the weather allows it, I hope to carry out spawnings in May - and I want the brood fish to be squeaky clean (.. of parasites) before then so I've started this week to add a series of preventative treatments to all my tanks to help me avoid parasite outbreaks during May. I started this week with fluke treatments, and will follow those up with 3 x MG &F treatments, one week apart in April. Looking at the growing on tanks - particulary the tank with the May 14 keepers, just looks overstocked. Lets consider what I have in there. In the May 14 tank there are approximately 30 tosai averaging 30 to 40cm. Plus 4 nissai (the males I purchased recently) - the two kohaku's are pushing 60cm now and the shiro's are around the 50cm mark. All of that in a 10k litre tank. ok, the overall system is 30k litres once you add in the other linked 10k litre tank (and filters etc)- and there are around 80 tosai in that one from the July 14 spawning and I estimate they average 30cm. Some havent grown too much are may still be in the low 20s but others are growing nicely and should be exceeding 30cm. There are two filters, and each have c.600 litre of K1 type media in a bubbling fomat. Pond turnover is roughly once per hour.